When you arrive at the Rose Bowl in Pasadena, you can feel the history of the tournament and stadium nicknamed, “The Granddaddy of them all.” For college football, this historic location is known for the Tournament of Roses parade and game, the original tournament blowout game in 1902 where Michigan beat Stanford 49-0, and the place where Roy “Wrong Way” Riegels earned his nickname. 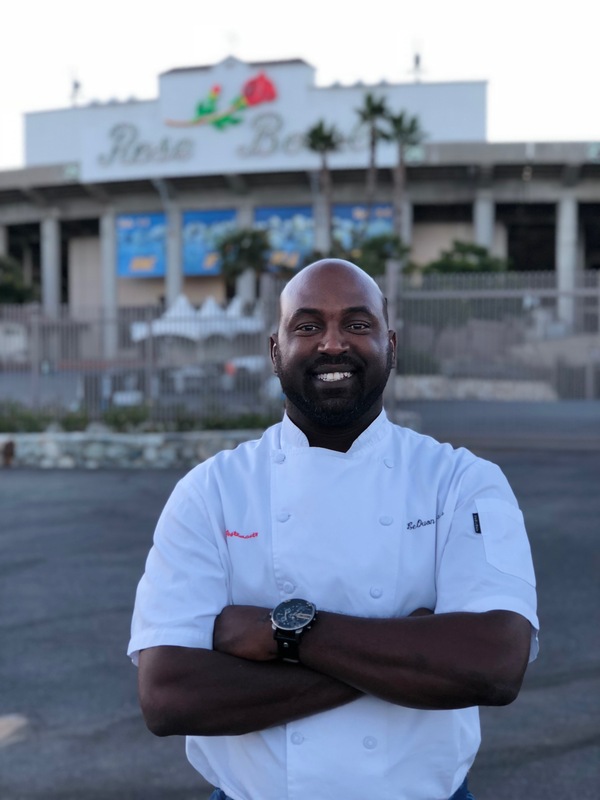 For Executive Chef LeQuon Stevenson, the Rose Bowl is a dream come true. Born and raised in California, LeQuon grew up a UCLA football fan and has worked as a chef for almost every major professional sport, from basketball and baseball to hockey and soccer, before entering the world of college football – and he couldn’t be more excited. LeQuon became a chef by fate. About 15 years ago, he met the former Executive Chef at The Forum, who got him interested in the culinary world, and then mentored and trained LeQuon to become a chef and inspired him to continue growing in the industry. Joining the Levy family at STAPLES Center in 1999, LeQuon dreamt of becoming the Executive Chef at The Forum one day, and in 2014 he made that dream come true. Now he’s taking on the world of college football as the Executive Chef at the Rose Bowl, bringing another dream to life. Q: You’ve been a chef for professional basketball games, baseball games, awards shows and so much more. What are you most looking forward to about being a chef for college football? A: When the Rose Bowl opportunity came along, I jumped at it. I’m looking forward to the energy of football. Having been in other buildings, the energy is different at each one, and football has a crazy energy that’s exciting and contagious. I’m a football fan myself, so it’s a bonus to be able to work in a stadium for a sport that I love. The Rose Bowl can hold an insane amount of fans, too, which amps up the energy. It’s a historic building, and we’re competing with the best of them. Q: How would you describe your cooking style and what college football fans can look forward to menu-wise this season? A: I love taking ingredients and turning them into something that people can enjoy. My cooking style is all about simple ingredients and simple food tasting really great. Chefs often overcomplicate things and there’s a market for complicated dishes, but for most people, we just want to eat great flavors that taste amazing and make sense to our palettes. We’ll be serving food that looks great and pops for the eye, but it’ll be clean, simple, great tasting food. Q: Being from California and the Los Angeles area yourself, what local flavors and partners will Pasadena residents recognize in the menu this season? A: Pasadena has such a great food culture. Even though I’m from LA, I haven’t had the chance to spend much time in Pasadena before now so I’m stoked to explore and learn more about the food culture here. We’re bringing great LA and Pasadena local flavors to the stadium this season as well, with places like Pie ‘n Burger, Carmela Ice Cream, Border Grill, and Home Brewed Bar to name a few. Q: When you’re not cooking for fans, what do you like to make or enjoy on gameday as a fan yourself? A: A couple of my friends are really talented chefs, and we love to sit around and cook when we’re watching football games, and we’ve come up with some cool, simple recipes. 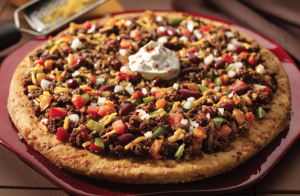 One thing we’ve made that’s great is an all-beef chili pizza. You can either make the pizza dough or buy some standard flatbread at the market, and then make an all-beef chili with a tomato base that’s not too spicy. We get some shredded cheese, onions, and tomatoes, spread a thin layer of chili on top of the bread and that’s it! It’s delicious, and the flatbread gives you that perfect flavor of crackers in chili. Add in 2 1/2 cups flour, salt, garlic powder and dried basil, stirring with a spoon until the dough comes together but it still sticky. Using your hands, form the dough into a ball and work the additional 1/2 cup flour (you don’t need to use all if it is not needed) in to the dough, kneading it on a floured surface for a few minutes. Cover with a towel and place in a warm place to rise for about 1 1/2 hours. Using a roll pin or your hands, form it into your desired shape (sometimes I use baking sheets and do rectangles or free form pizzas). Place the towel back over the dough and let sit in the warm place for 10 minutes. While the dough is rising again, melt 3 tablespoons of butter. Mix it with the garlic and 1 tablespoon of parmesan cheese. Bring the dough back out and using a spoon or pastry brush, douse the outside edges with the butter and garlic mixture. You can spread the butter all over, just make sure to focus on the edges. Use it all up! Remove the lid and continue to simmer for an additional 45 minutes. Season with additional salt and pepper to taste before serving. Garnish with shredded cheddar cheese and sour cream, if desired. Leftover chili can be stored in an airtight container in the refrigerator for up to 4 days. The chili can also be frozen for up to 1 month (let the chili thaw in refrigerator for 24 hours before reheating). Preheat the oven at 350º F.
Rub fresh garlic and olive oil directly onto a non-stick baking sheet. Spoon chili mixture into pizza round and flatten out. Bake at 350º F for 15 minutes. Remove from the oven. Garnish with thinly sliced green peppers or any other vegetables of your choice. Return to the oven or broiler, just long enough to roast the vegetables to taste. Remove pizza from oven and immediately brush the outside edges with parmesan butter, using it all up. Sprinkle a bit of parmesan over top if desired. Sour cream also goes well over top of this recipe. Serve and enjoy!